What ever your needs – we’ve got you covered. 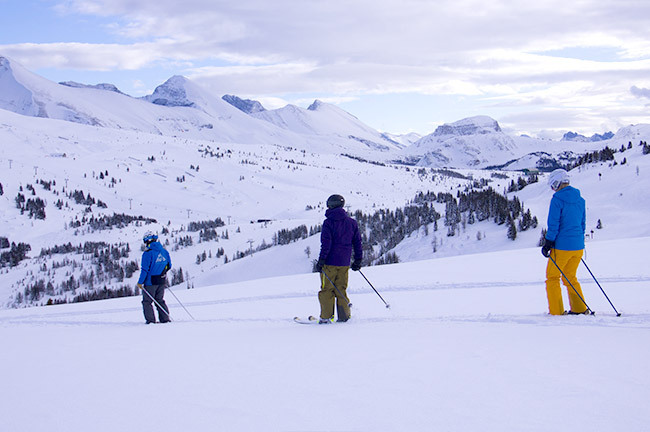 Lessons & Guided Adventures take place at all three ski resorts: Banff Sunshine, Lake Louise Ski Resort and Mt Norquay. That means on top of learning from a certified instructor, you’ll also be shown where to find the best powder and most stunning views. Exclusive one-on-one attention from our top certified ski & snowboard instructors. Create your own experience with a group of up to 5 participants. Quickly gain confidence. First-timers & learners can select from a wide selection of ski and snowboard programs available at each of the three resorts. Building skills and having fun is key to introducing the young-ones to the joy of sliding on snow. Lessons are the best way to develop a life-long passion for the sport. Want to learn from the best? 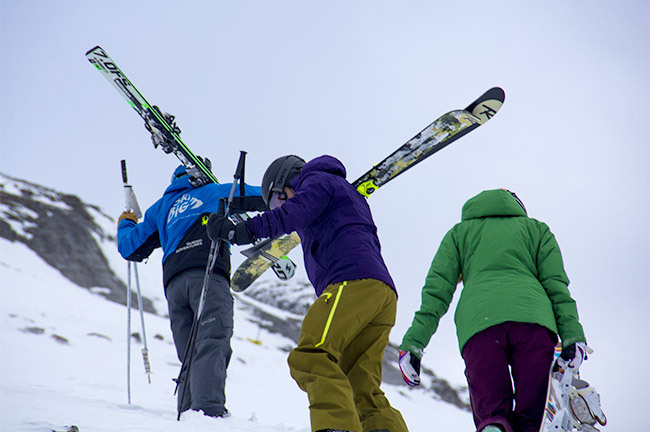 SkiBig3 Sno-Pros are top level CSIA certified instructors who know these mountains like the back of their hand, and can quickly work to improve your on-mountain skills. 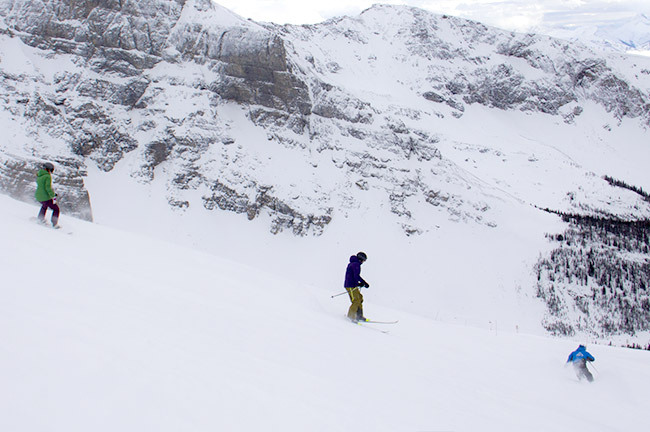 All that insider knowledge means you’ll be able to discover SkiBig3 like a slope­ savvy local. Choose from private instruction or head out with a group of like-minded skiers on a Guided Adventure. Book your private ski instructor/guide and your experience is fully customizable. The night prior to your lesson, your CSIA certified guide will connect with you to determine your ideal day on the slopes. You can determine which resort you want to explore, what time you want to start, how much lesson/guiding suits your style, and what type of terrain you want to master. Its completely up to you. Create your own experience with a private group of up to 5 participants. You’re probably a better skier than you think. And after just one day on a Guided Adventure, you’ll get a huge boost in confidence that’ll allow you to enjoy the Banff and Lake Louise conditions and terrain even more. That’s because our certified instructors have a track record of helping others boost their slope skills in a short amount of time. Snow School is not just for newbies. Some folks who sign up have ample ski experience, but want to make the most of their time on-mountain with a Guided Adventure. Others want a private experience to learn and explore on their own terms and discover the best of this vast and impressive destination. Some are looking for the basics with a learn-to-ski or beginner group adult or kids lesson. SkiBig3 can help find the perfect experience to match your needs. Perfect for blue-intermediate skiers and above. Full or half-day at the resort of your choice for 1-5 friends. Learners of all ages are welcome at SkiBig3! Each resort offers group lessons, kids programs, and endless opportunities for improving your ski skills! SkiBig3 Guided Adventures allow you to experience the best of Banff Sunshine, The Lake Louise Ski Resort, and Mt Norquay. Designed for intermediate skiers & riders blue and above, groups are broken out by skill level and terrain preferences. While snow pros hit the slopes on skis, snowboarders are welcome to join all groups. Tips and coaching provided throughout. Guided Adventures can be started any day of the week, and run daily from 10:15am – 3:30pm with a lunch break. SkiBig3 Lift Ticket not included in price – must be purchased separately. Programs run December 16, 2018 – April 22, 2019. Guided adventures are available for $440 CAD 3-day program, or $176 CAD – 1-day program. Book online & save 15%. You’ll be shocked by how much you learn within a small amount of time. With a private lesson, you or your group will get custom ­tailored instruction from a top certified ski professional. Plus, you also get lift line priority. Up to 5 friends and family of similar ability can participate in one private group. SkiBig3 Lift Ticket not included in lesson price – must be purchased separately. Young or young at heart? At SkiBig3 we invite you to have fun as you learn to discover and improve your snow abilities. Our adult and kid lessons are availbale for every level of skier and rider from the first-timer to those who want to improve their skills and have fun at the same time. Group lessons for designed for Adults and Kids are available at all three ski resorts: Banff Sunshine, Lake Louise Ski Resort and Mt Norquay. Book your lesson with SkiBig3 and get ready to hit the slopes with confidence. SkiBig3 is a family friendly destination with everything you need to make memories for a life time. Kids programs are available for every level of skier and rider from the first-timer to those who want to improve their skills in a fun, supportive and safe environment. 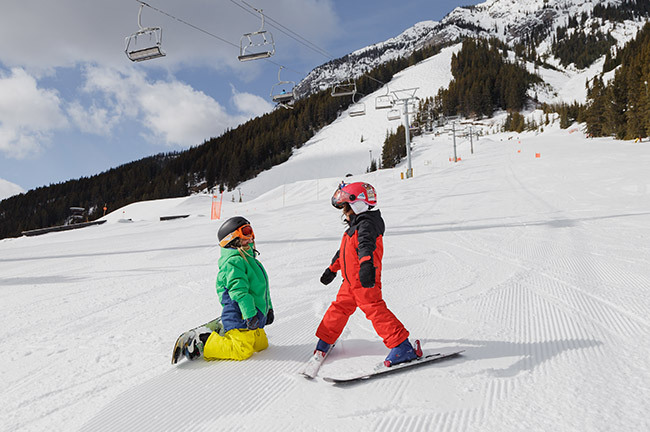 Kids Programs are available at all three ski resorts: Banff Sunshine, Lake Louise Ski Resort and Mt Norquay. Book your lesson with SkiBig3 and get ready to hit the slopes with confidence.